You wonder what the difference between Chelow and Polow is? The difference is huge! Chelow is simply white rice which is usually made along with Khoresht, stew. Polow is rice that is usually mixed and cooked with vegetables, herbs, and/or meat. When making polow we follow the same exact steps in making Chelow as far as the intial cooking of the rice goes. The only difference is that in Chelow the rice is steamed by itself whereas when making polow we layer the rice. I say this over and over again, making Persian rice is an art. It requires patience and a couple of practice runs. Here are the basic few steps in the initial cooking of rice for Polow. 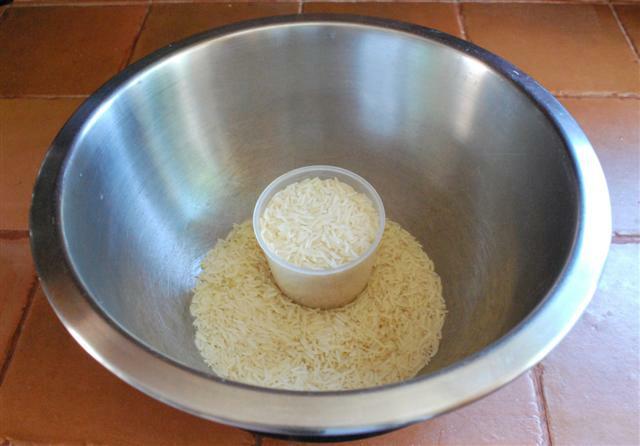 Scoop out as many cups of rice as needed for your recipe in a bowl. 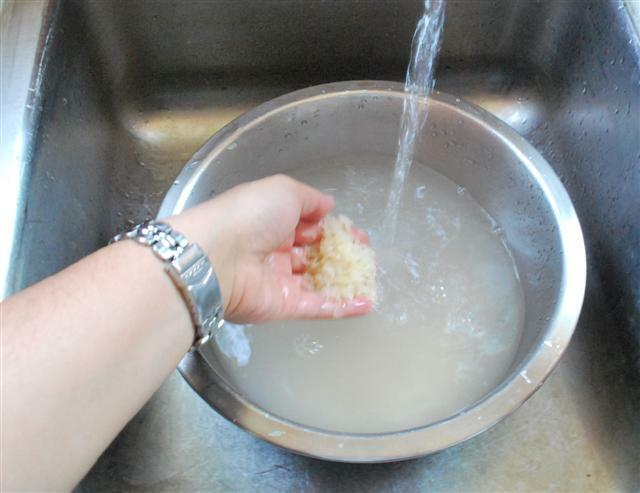 Wash rice several times until water runs clear. 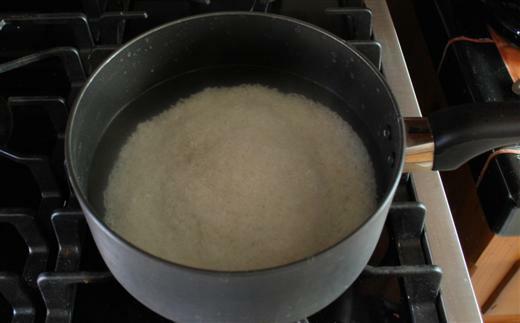 Soak rice with salt either over night or at least about an hour. It’s not the end of the world if you don’t soak, but it does make a difference. Bring water to a boil. Add salt. Place rice in, minus the water that it was soaked in. 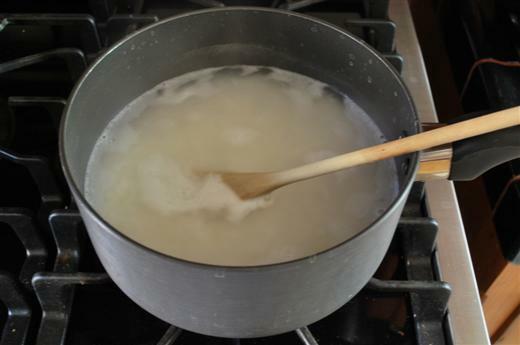 Keep an eye on it, as soon as the water starts boiling again it should take about 10 minutes for the rice to cook. 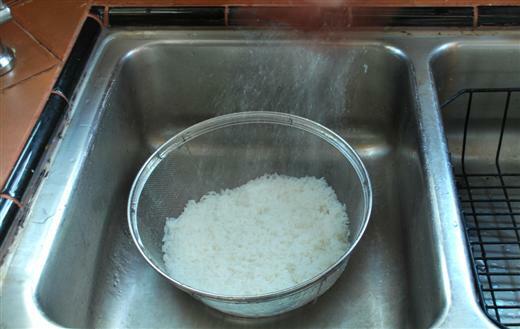 While the rice cooks gently scoop the rice from the bottom of the pot and bring to the surface and release. Do this step several times. NOTE: Do not stir. Place a colander in the sink. You might want to choose a colander where the holes are small so that the rice won’t escape. Check the rice to make sure it is cooked. It should be soft and cooked but not mushy. 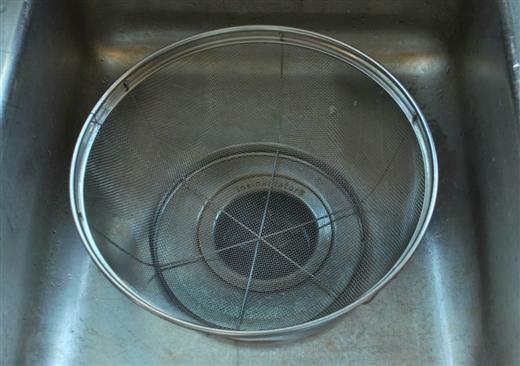 Drain rice in colander. Rinse with cold water to stop cooking process. And voilà! Now you are ready to proceed to the next step of Polow making! Do you have any tips for making rice in large quantities. We want to have a Nowruz party with 40-50 guests. Teresa, the general rule of thumb for making rice is one cup of rice for two people. Good luck with the party! I could kiss you for saying making “Persian rice is an art” sooooo true!! I would gladly take the kiss! Love your blog! Where did you obtain your colander? I have a small mesh one but I have to drain rice in two batches. Homa, thank you for your kind words. I honestly don’t remember where I got the colander. I have had for 6-7 years. sorry I can’t be of help! How do I make sure that the rice is not sticky ? I like the grain to be separate. Marie, you have to make sure that the rice is not over cooked and cook the rice based on the directions of this post. But also you may want to make sure that you use basmati or jasmine rice. Just writing in to say this…..I’m from India, and you will not be surprised to know how much similar Persian dishes are to several Indian ones….I make a some biryanis, and yakhnis myself…. seal, cook by dum pokht…. My humble question: will the rice ever get cooked in just the moisture from the meat , and the curds, and no additional parboiling of the rice is required? Love your blog, and looking forward to more posts…. Amarnath, I love Indian food myself and I definitely see the similarities in our cuisine. In my humble opinion, the rice should be par-boiled before being steamed. 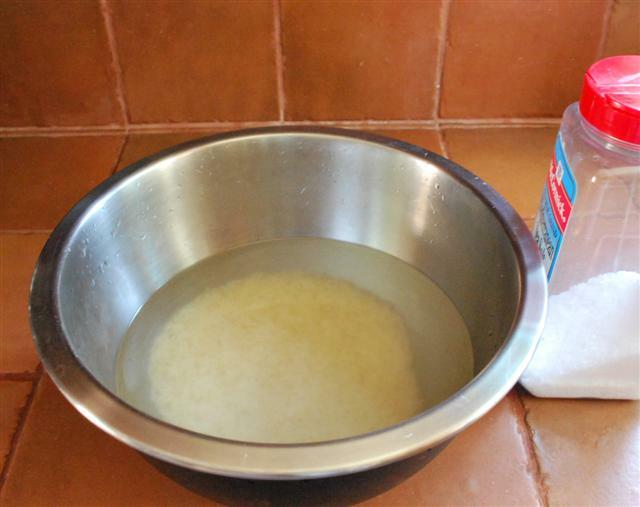 You don’t say how much milk to add the pot, but regardless, the rice needs a minimum of twice its amount of liquid to cook. I hope this helps! You do not say anything about covering the lid with a cloth for this recipe. Is there another rice recipe in which the dish is covered while it steams? Thank you so very much for creating this site. It has been very helpful to the novice cook. Kim, this post only covers the first step of making rice, basically the par-boiling portion for when rice is steamed with other ingredients. For a full tutorial on how to make white rice from beginning to end please click here. Hi, I am from Saudi Arabia and loveeeeeeeeeee persian rice, it tastes very different than our rice for sure. I am just curious, how many cups of water do you add per cup of rice. or do you just add a lot of water in the cooking pot? thank you soooooo much. love your website. Crazy about Persian food, thank you for your kind comments! I looooveeeee Persian rice too!!! I have found that the best ratio for me is 1 cup of rice to 3 cups of water. It’s me again….I really want to learn how to cook rice the Persian way.They do it the best, IMO. 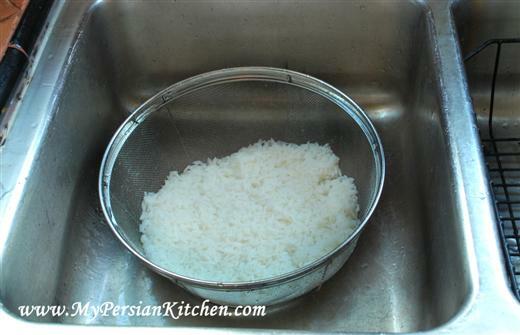 I came across so many varying bits of information on cooking rice the way Persians do, but I’m still confused….Is it necessary to soak rice in salted warm water at all? Amarnath, you don’t have to soak rice in water, but it’s best if you do. And it has to be room temperature water, not warm. I hope this helps. Just a question: doesn’t cooking the rice that way i.e. boiling, soaking, rinsing, – doesn’t this take away all the vitamins and nutrition and fibre of the rice? Pam, I am not a nutritionist but I presume that it might. Salam alaikum, Thanks for this recipe I used to continue on with your, Zereshk Polow ~ Rice with Barberries. The rice was perfect! Masha Allah (Praise be to God). I will use this method often. In your opinion, what is the best sort of rice (for chelow)? I prefer basmati (it always keeps it’s shape, it has nice smell, it’s not easy to spoil:) but I’m told over and over again that the best sort is Iranian tarom. I don’t like it’s smell, shape, it is always sticky etc. I do know how to cook rice:), but I really can’t understand why everybody is so crazy about tarom. Is it really the best? :) For me it tastes ok only when I make a kind of mixture with chicken, onion etc. Kitty, my favorite rice for chelow is Basmati. Great tips Thanks! I want to cook rice for 50 guests. Any ideas – should I use a huge put and cook regularly? I don’t want to make a mistake as I’m having a huge dinner party! @ Kelli, I would definitely use a big pot. 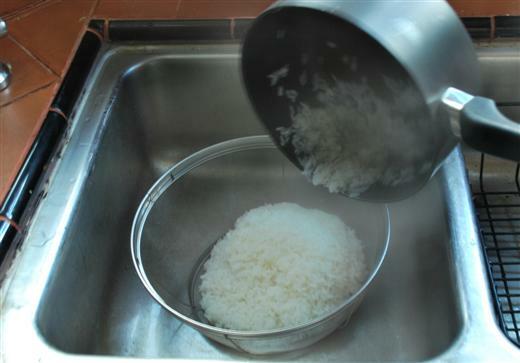 The first part of rice making which is par-boiling can be done together, but once you go to the second stage, they clearly have to be separated. Wonderful blog! A question please about Iranian rice cookers: will they run on US 110-120 volt, 60 cycle current or are they built for 220 volt, 50 cycle current common in most places globally? With your permission, if I might weigh in on Amarnath’s query, because he has taken up a very specialized niche of the biryani family known as the kacchi-kacchi, or raw + raw, indicating that both rice & meat go in raw. There are several important specifics to making this a success, but the general principle is that the rice needs a substantial amount of fat rendered from the yoghurt being absorbed & other sources, including the meat. The shape of the cooking vessel is very important here, and when the steam-cooking is under way, one gauges the process by SOUND. The frank water is absorbed, and the rice is literally “crackled” in the fat. The changeover is distinct. My friend actually reserves a stethoscope to accurately gauge the minute transitions within the kacchi-kacchi lagan, a specialized vessel in which the rice is sealed under moistened cotton cloth. In different types of biryanis, the acidity of the cooking liquid is manipulated to control the gelling properties or “hardness” or mouthfeel of the rice. HOWEVER, the yoghurt should never be sour! SPECIFICALLY the North Indian complex of yoghurt culture must be used, not the South Indian, and no souring allowed to occur when it is set. Amarnath can get the cultures from CFTRI, Mysore, if in doubt. It matters a lot what milk was used, cow or buffalo. Cow milk, 5.5 % butterfat, 11-13% Solids Not Fat, set in unglazed clay, will have the right amount of liquid for this purpose. Buffalo has 7-10% fat & sours easily, & has a different quality to it; will not matter much in kacchi-pakki biryani. Further, the type of meat and rice, and amount of added ghee (c.750 grams here! ), has to be carefully balanced. There are most excellent accounts on the web, but they are one or two in number. The problem today with Indian cookery is that a herd of shrewd journalists, impresarios, & hotel cooks claim instant expertise by dint of publicity, with none being able to contest their absolute drivel. Much can [and needs to ] be written about the subject of rice alone. What is sold as “basmati” today occupies a very broad genetic spectrum, and hence, cooking qualities. The same applies to jasmine rice. Pray pardon this acerbity, because in one lifetime, I have witnessed the irrevocable extinction of 80% of more than one cooking tradition in India built up over centuries — not just preparing the food, but also the why & hows of consuming it, along with the tehzeeb & insaniyat. Gautam, Persian rice cookers are made for both use in the US and other parts of the world. You just have to make sure that you purchase the correct one. It seems that Persians are as passionate and methodical about polow as Italians are about pasta–Every minute detail counts! Since I am gluten intolerant I am more interested in learning how to make Persian rice dishes. This site is a great resource! To answer the question above about rice nutrition, white rice has already had most of its nutrition removed (it’s in the outer portion of the grain). However, there is some science behind soaking–All grains, legumes, nuts and seeds contain certain antinutrients that block the absorption of essential vitamins and minerals. Soaking, sprouting and fermenting all help to remove these antinutrients from the rice. The most nutritious option would be sprouted whole grain rice. A few years ago i had Persian dill rice at a Persian restaurant in NY and loved it. So this weekend i finally decided to try to make it myself. it took two attempts. On my first attempt I followed your advice for boiling rice for 10 minutes until it was fully cooked. Then i followed the steps for making dill rice. In the end the rice was completely overcooked – it turned into mush. next day i tried it again, but boiled rice for only 5 minutes, so that it was still pretty hard. Then I took the next step, and it came out perfect. So, the lesson for me is that if you boil rice just to eat it plain, then 10 minutes is the right cooking time. But if you are going to use it making a rice dish, cook it for 5 minutes only. Does this make sense? Alex, you cook the rice until it’s al dente, never fully cooked! Hi, You don’t say how much water to cook the rice in. John, 3 cups of water for every cup of rice! I cannot wait to try this as I love rice dishes also so I can learn to cook for the Persian I plan to marry. Hi there! What type of rice is most commonly used in Persian cooking? Thank you for these recipes! Bridget, we use Basmati rice. If I am making something like lubia polow, can I do this and then finish it off in a rice cooker? Is there a way to pin this on Pinterest?